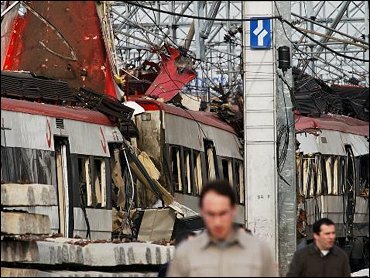 Police in Italy and Belgium have arrested at least eight suspects in the March 11 train bombings in Madrid that killed 191 people, including an Egyptian alleged to have been preparing further attacks, authorities said Tuesday. The main suspect, who was picked up in Milan, was identified by officials at Spain's National Court as Rabei Osman Ahmed, a 33-year-old Egyptian. A senior Spanish law enforcement official described him as a "key figure" in the March 11 attacks. The Italian Interior Minister Giuseppe Pisanu said in a statement that Osman Ahmed was "probably among the principal authors" of the Madrid bombings, and that he "was preparing other attacks." The suspect was arrested on a warrant issued by Judge Juan del Olmo, the magistrate leading the probe into the bombings, said the officials at Spain's National Court. They said they would request his extradition on multiple counts of murder and attempted murder. Osman Ahmed was identified by people living near a decrepit rural cottage where the bombs used in the attack were assembled, the Spanish court officials said. Fingerprints of several key suspects were found in the cottage. One other suspect was arrested and one held for questioning in Italy, while six were apprehended in Belgium, Italian and Spanish officials said. The other man who was arrested in Italy was the landlord of the Egyptian's apartment in Milan and also used to live there. Italian news reports carried by RAI state TV and TG5 private TV identified him as a 21-year-old Palestinian Yahia Payumi, and said he was accused of association for international terrorism, a charge introduced in Italy after the Sept. 11 attacks. Pisanu said in the statement the arrests hit a terrorist group with links to al Qaeda, but did not name the group. Authorities in Spain have blamed the Madrid bombings on Islamic militants with possible links to al Qaeda. The Spanish Interior Ministry had said as far back as April 4 that Osman Ahmed was a suspect. Spanish radio station Cadena Ser quoted police as saying he is an expert in explosives and was in Spain in 2003, but left the country months before the March 11 attacks. Police said he had close ties with the accused ringleader of the attacks, a Tunisian named Serhane Ben Abdelmajid Fakhet, said Cadena Ser. The Spanish government says Fakhet was among seven suspects who blew themselves up on April 3 as police tried to storm their apartment outside Madrid and arrest them. The March 11 bombs, planted on four commuter trains, also injured more than 2,000 people. Before Tuesday, twenty people, mostly Moroccans, had been charged in relation to the attacks, including six for mass murder. Of these 14 are in jail, while the other six are required to report regularly to authorities. Several dozen more people were questioned and then released.